This week's edition will be slightly different from normal as we won't be looking at one show from Friday, Saturday & Sunday. Instead we'll have a brief look at all the shows taking place. Let's get Ready For The Weekend! 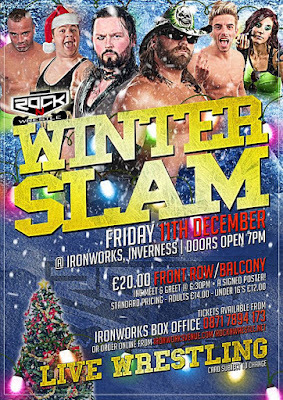 On Friday night, Rock N Wrestle will be at the Ironworks in Inverness with Winter Slam 2015. The show will feature TNA & NXT star, James Storm who will be facing Kid Fite. Grado shall also be in action on December 11th as he competes against Liam Thomson. Fans will get to be involved as they choose the stipulation of the match between Aspen Faith and Crusher Craib. The Rock N Wrestle Highland Champion, Jack Jester, Big Damo & BT Gunn are also scheduled to appear during the show. Heading south to Bristol and Pro Evolution Wrestling will be at the Merchant's Academy. Pro Evolution Wrestling have had a great year, delivering shows month in, month out. At their last show, Justin Sysum defeated Joel Redman to become the new Pro EVW Heavyweight Champion, proving that anything can happen at any show. Another promotion that has had a killer year has been Britannia Wrestling Promotions. On Friday night they will host the last show of 2015, which marks their 7th year as a promotion. Lots of feuds and lots of fights have taken place this year. Chances are that more will take place on December 11th in the Penyffordd Legion. 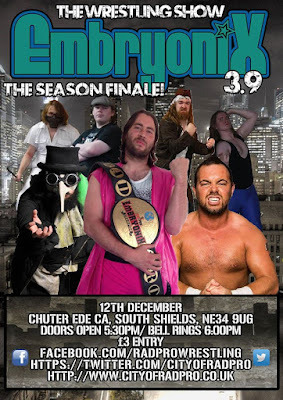 Moving on to Saturday and RAD:PRO Wrestling are back at the Chuter Ede CA in South Shields with the season finale, EmbryoniX 3.9. The show will feature Mr Society defending the EmbryoniX Championship against an opponent to be announced on the night. The winner of that match will want to keep an eye on the over the top rope battle royale as the winner will be the new number one contender to the EmbryoniX Championship. December 12th will see former allies Paddy Flannagan and Vulture face off after Vulture joined the Social Order. All those matches plus James Scott, Steve The Pirate and a lot more will be in action. Pro Wrestling Elite are at the Citadel Leisure Centre in Ayr on Saturday night with Jingle All The Galloway. They have a packed card with the main event seeing Drew Galloway face Dave Mastiff. Grado will also be in action defending the Pro Wrestling Elite Heavyweight Championship against Joey Hayes. Speaking of heavyweight, Damo, Joe Coffey, Iestyn Rees & Noam Dar will also compete in a four-way match. Action from NXT's James Storm, Wolfgang, Chris Renfrew, Mark Coffey, El Ligero and Joe Hendry guarantees a cracking show in Ayr. Not content with one nigh of action, Pro Evolution Wrestling move on to Worchester on Saturday night with another show. As we said before, Pro Evolution Wrestling have had a great year and they'll look to end it on another high, this time at Perdiswell Leisure Centre. 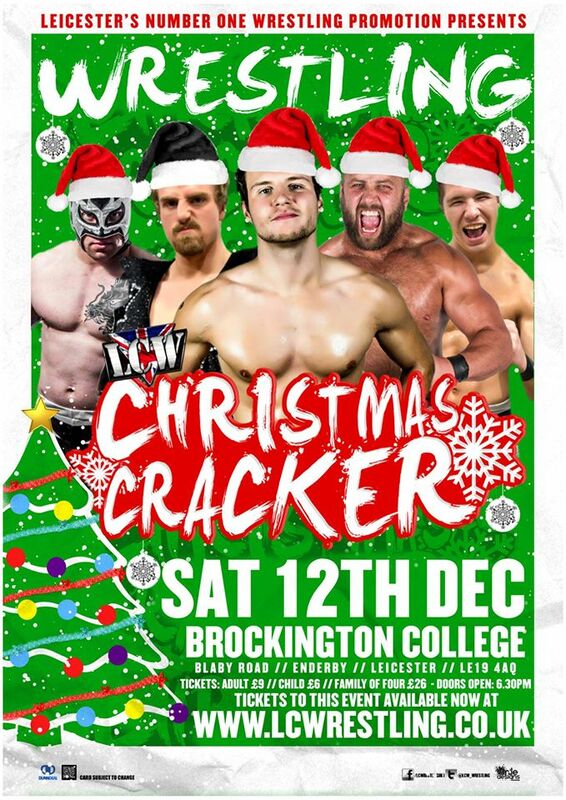 Leicester Championship Wrestling are at the home of Brockington College on December 12th with their final event of the calendar. 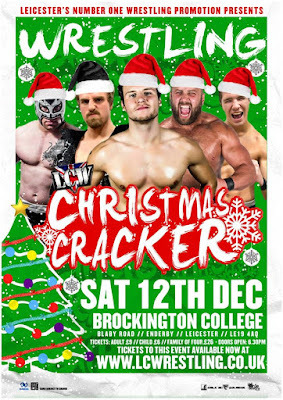 Christmas Cracker 15 will see all of LCW's championship on the line with Joseph Conners defending the LCW Heavyweight Championship against Alex Gracie. The Hunter Brothers will challenge DNA's Cy Gregory & Mark Massa for the LCW Tag Team Championship. Finally, Chris Tyler will be in action as he defend the LCW Young Guns Championship against Paul Malen. Even more action takes place with Stixx, Xander Cooper and many more in competition. Finally finishing up the weekend and Tidal Wrestling host Silent Nightmare – End Of Days at the Leeds University Union. The show will be main event by Dara Diablo defending the TCW Championship against Liam Lazarus and El Ligero. This match would be show-stealing on any show but with the added dynamic that there shall be no DQ or count out in the match, this may indeed be the End Of Days. Speaking of championships, Sam Wilder will be defending the TCW Open Championship for the first time. His opponent is the ever growing and evolving Chris Ridgeway. If Wilder is successful in his defence then his Proven partner, Caz Crash will then defend the championship against Dan James later on in the night. It's another packed show from Tidal Wrestling with Tommy End, Rampage Brown, Martin Kirby, Nathan Cruz, Pete Dunne and Joseph Conners being just a few of those in action.